For efficient combustion, a modern diesel engine requires several thousand times as much air as it does fuel. Under normal operating conditions, to burn one gallon (3.79 liters) of fuel you have to clean 15,000 gallons (56781 liters) of air. Add a turbocharger to that engine, and air consumption requirements increase by 20% or more. 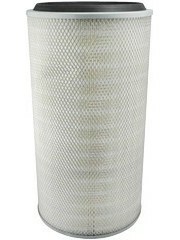 Proper air filtration is important because a small amount of dirt can cause a tremendous amount of engine damage. The purpose of the air filter is to promote long system life by keeping damaging contaminants away from sensitive engine components. To improve dust holding capacity and air flow, Baldwin Filters uses two proven methods to separate and stabilize the pleated media. PermaPleat® – an embossing process that forms dividers between pleats to prevent bunching and ensure uniform air flow. Beading – a continuous bead of adhesive around the circumference of a filter's metal wrap, either inner or outer, to lock the pleat tips in place and prevent movement.